I’m going to take it back to a rendition of an old quote by Benjamin Franklin that reads a little something like this: ‘By failing to plan, you are planning to fail.’ Wise words Ben, especially when it comes to something near and dear to our hearts. Wedding Planning. It can seem like a daunting task but hiring the right planner can truly make your wedding woes dissipate and leave you with an outlook of excitement towards your wedding day. 1. They have vendor connections. This is huge when planning a wedding as I tell all of our potential clients that it is important to find a vendor that you connect with emotionally, aesthetically and financially. Once we get to know you, your personality and details about your event, it is a lot easier for us planner babes to determine from our extensive vendor list who is going to fit your mold best. 2. Managing the ‘B’ word and avoiding costly mistakes. Budgeting can be downright overwhelming to brides (and their mommas!) when planning a wedding, as most people have no idea all of the expenses that have to happen just to ensure a successful event. Planners are savvy and able to give you insight on how to create a budget that fits within your vision. Creating a healthy budget to account for your goals is crucial at the beginning of planning stages and having a professional to guide you in the best financial decisions is super helpful to keeping you out of wedding planning woes. 3. They can negotiate. 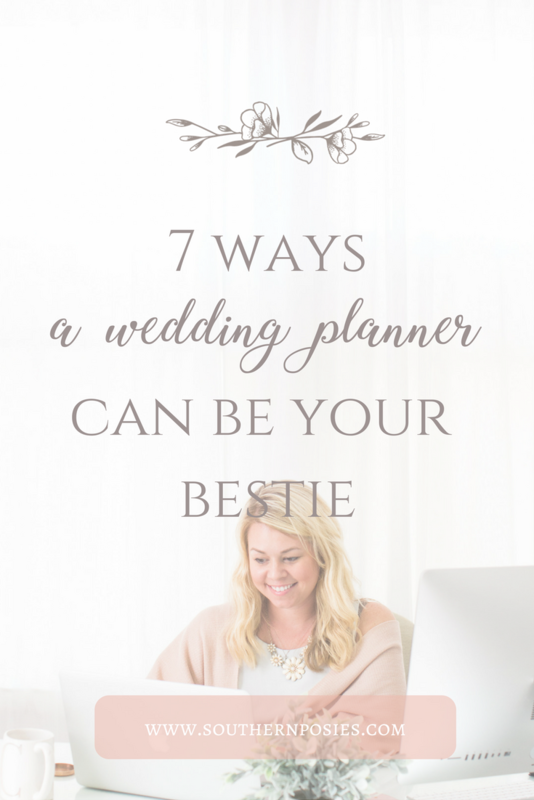 Most of the vendors that planners recommend are people they work with week in and week out. It is a lot easier for them to negotiate things on your behalf, especially any discounts or rates and even quick response times. 4. You are able to enjoy this sweet season. It is normal for seasoned planners and designers to spend between 300-500 hours on one event. That’s a lot right?! But you have to think about all of the meetings, emails, conference calls, contract and estimate reviews, travel, layouts, logistics, design brainstorming, save the date and invitation assembly, etc. and we have not even gotten to the week and day of yet. Our team is oftentimes working 20 hours just on the event day alone! Handing all of the details over to a professional will leave you with margin to enjoy and savor this time with the ones you cherish most instead of worrying about all the little details. 5. They can handle the ‘Double L’. Logistics and layouts, y’all. While you see a vision in your head for your ceremony and reception venue it is important to remember that sometimes what looks good on paper does not flow well at an event when you start adding in 500 people. We like to create a 2-D and 3-D layout for our clients to show dimensions, placement and a virtual ‘bird’s eye view’ of the ceremony and reception space. Planners also think about those little things like proper power requirement for your entertainment to the prep location for the caterer and ease of load in as well as Plan B’s, C’s and D’s for inclement weather. 6. Wedding Therapy. A good planner serves as a buffer in tricky situations. Whether it is your future MIL adding 50 more to the guest list when there simply isn’t room or your MOH not getting measured and ordering her dress by the deadline. A planner is a really good neutral person that can help alleviate tense situations and be a great sounding board in solving disagreements. Don’t worry, we will bust out the wine if necessary and be your go-to gal pal for venting, too. 7. Timely Timelines. Your wedding day will involve an array of moving parts including vendor arrivals, setup locations, sound and lighting checks, rental placement, linen steaming, photography schedule management, vendor questions and not to mention keeping all of that beautiful bridal party in check, so a detailed timeline and management of said timeline is crucial to ensuring a seamless event.